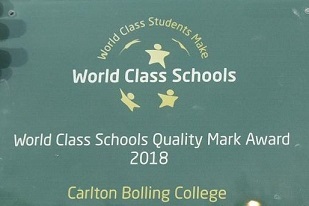 Carlton Bolling is delighted to announce that it has been awarded the ‘World Class Schools Quality Mark’ as a result of the outstanding practice which takes place in the school. The World Class Schools Quality Mark is the new standard in education for schools who have moved beyond outstanding and the Carlton Bolling community has achieved impressive results year on year, resulting in an ‘Outstanding’ Ofsted judgement in October 2017. 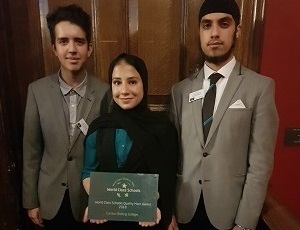 WCSQM awards a quality mark to non-selective state schools that offer the best education to young people in the UK. Unlike other national assessment bodies, they assess the student and not the school, against a framework of skills and competencies young people need to flourish in an emerging global economy. 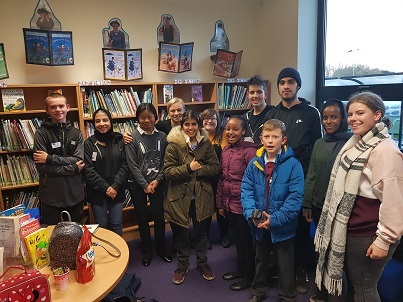 Through unique real-life work experiences, access to a lifelong peer support network and cultural opportunities that take them beyond their local community, we give world class students the confidence to overcome socio-economic barriers to recognise and achieve their potential. World Class students have the skills and disposition to succeed in the global environment in the 21st century. They are taught in a school which is exceptionally well led and organised, basing its decisions on evidence most pertinent to the student, and Carlton Bolling students demonstrate time and again how well-rounded and prepared they are for the next stage of their lives. Schools who achieve the World Class Schools Quality Mark will be in a position to rival the best schools internationally. Headteacher Adrian Kneeshaw commented, “This award is testament to the hard work and sheer dedication and determination of each and every student and member of staff at Carlton Bolling, and we are extremely proud to belong to such a select network of schools who hold this award.